We spent most of the day on a city tour of this ancient city. Our guide was very informative and told us all about the Hindu Gods and Goddesses. They still take part in ritualistic animal sacrifices and we had the opportunity to see one of these during our trek, as we approached Gorapani. There is contrasting difference between the Hindu temples and the Buddhist temples. Like the difference between gray scale and color. 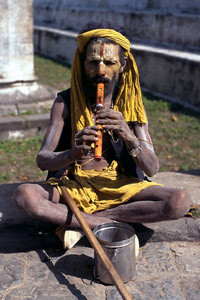 The Hindu people wear darker colors and the structures are old and dark. The Buddhist people wear very bright reds and yellow and the structures are just as bright. The pictures below show some of the places we visited during the city tour. I apologize for the quality of the photos. At the time our trip, back in 2003, I took only a film DSLR and have since lost the negatives. Until I find them I won’t be able to replace these with digital reproductions. 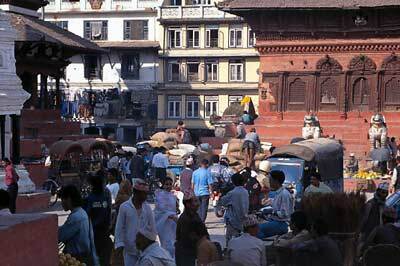 The most interesting place we went to was to Pashupatinath on the banks of the river Bagmati. 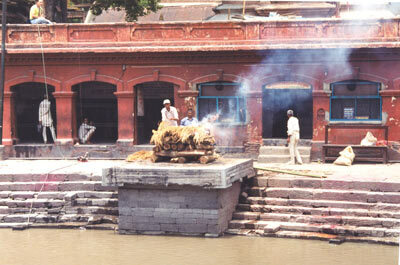 This is where the Hindu people have the funeral pyres. We were able to see a funeral in progress. 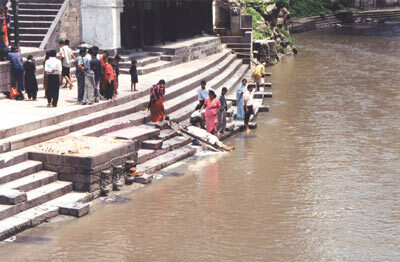 They first washed the feet of the dearly departed in the river to cleanse their way into the next life. Then they placed him/her on top of a platform covered in wood. They set it ablaze and stand by for 4 hours while the cremation happens. No screaming family members, very dignified, and very, very, public. 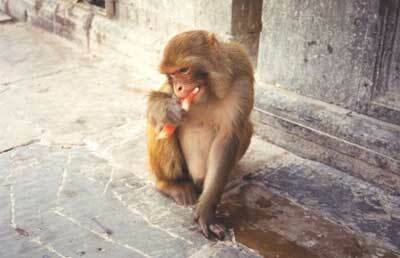 Some of the more colorful people we encountered at Pashupatinath. 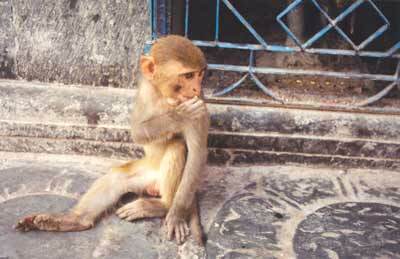 The monkeys of Pashupatinath and Swayambhunath (aka Monkey temple). 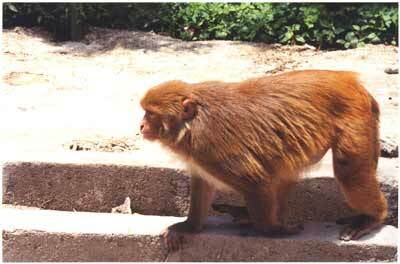 They are very accustomed to seeing people and let you come right up to them for a photograph. 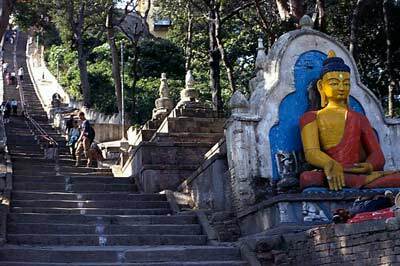 A statue of Akshobhya, one of the Five Wisdom Buddhas, at the foot of the stairway to the Swayambhunath Temple. Bodhnath Stupa during a celebration. Our hotel in Kathmandu: The Marshyangdi. 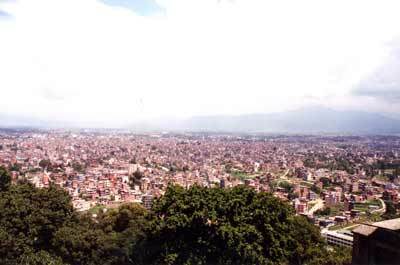 If I return to Nepal I will stay at a higher end hotel. This hotel was fine but it was in the middle of the shopping district and had a gate that locked at night and security guards. The neighborhood was questionable although it was convenient. 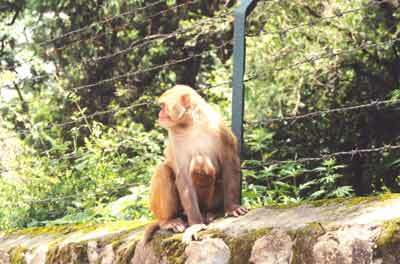 It was the hotel that was setup for by the trekking company to keep costs down. 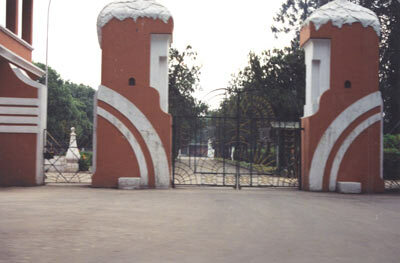 The gates of the Royal palace in Kathmandu. 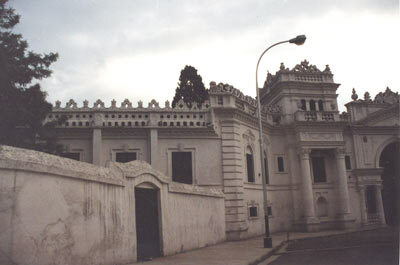 Home of the Nepal Royal family.